Guest post by Scott Wisor. 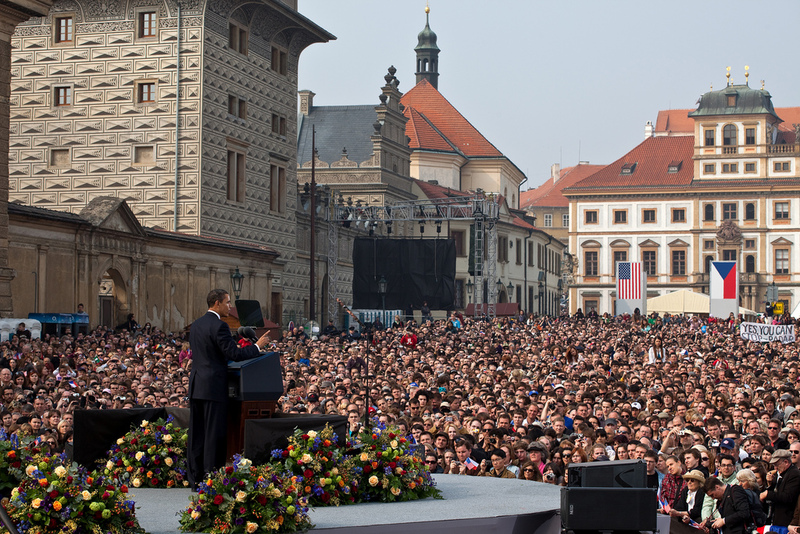 President Barack Obama delivers his first major speech stating a commitment to seek the peace and security of a world without nuclear weapons in front of thousands in Prague, Czech Republic, April 5, 2009. Photo via The White House. President Barack Obama has become the first sitting American President to visit Hiroshima, following on US Secretary of State John Kerry’s visit last month. Both Obama and Kerry took the opportunity to call for a world without nuclear weapons, and both made their argument in stark moral terms. Obama argued that we can choose “a future in which Hiroshima and Nagasaki are known not as the dawn of atomic warfare but as the start of our own moral awakening.” This call for moral progress will involve, among other things, that “those nations like my own that hold nuclear stockpiles, we must have the courage to escape the logic of fear and pursue a world without them.” These visits serve as a book-end to the famous Prague speech of 2009 in which the President initially made his case for a nuclear free world. But this sustained normative commitment to nuclear abolition has not been matched by nuclear policy that is consistent with the desire for a nuclear free world. 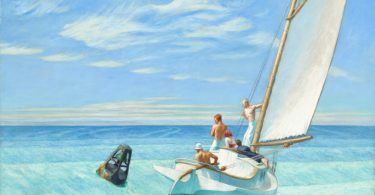 Rather, the lofty rhetoric has been matched by a nuclear policy that appears to increase the risks of nuclear proliferation and prolong, for many generations, American possession of nuclear weapons. It has not been all bad news. The Obama administration will be rightly remembered for some of its achievements in nuclear nonproliferation. Against sometimes hostile domestic opposition in both countries, the nuclear deal with Iran is a signature achievement, offering a non-violent method of preventing nuclear proliferation in Iran (if Iran does acquire the bomb, this would potentially lead to further nuclear proliferation in the Middle East, though this is debated). Obama has also led a series of nuclear security summits, which has resulted in some successful efforts to secure nuclear material against potential theft. But despite the normative commitment to a nuclear free world, the Obama administration has a) moved more slowly than its predecessors in reducing the nuclear stockpile, and b) authorized strategic upgrades of the country’s nuclear arsenal to the tune of 350 billion dollars over the next decade (other estimates put the cost as high as a trillion dollars), committing the country not just to continued possession of nuclear weapons but to a strategic posture that aims for increased nuclear capabilities, potentially fostering a new arms race. Strategic nuclear upgrades may undermine three objectives of broader nuclear policy. First, they may undermine the stability of extant nuclear deterrence. Nuclear deterrence relies on mutual vulnerability. When one state seeks to develop capacities in its nuclear arsenal, this may cause one’s potential adversaries to reconsider their own nuclear posture, particularly if the new weapons create new vulnerabilities. Strategic upgrades may be (in rare circumstances) justified when it is necessary to establish a balanced deterrent relationship with an adversary. But the United States does not require nuclear modernization to have an unquestionable deterrent against all potential adversaries that possess nuclear weapons. While proponents of nuclear modernization might argue that such changes are necessary to counter Chinese expansionism in the South China Sea or Russian intervention in Ukraine, this is mistaken. First, the extant American arsenal, and indeed a much smaller version of it, would maintain stable levels of deterrence. And second, nuclear weapons cannot deter such regional expansion and intervention because America and its allies could never (and should never) credibly threaten to use nuclear policy to effect change over such comparatively minor foreign policy matters. Second, strategic upgrades may undermine the cause of nuclear non-proliferation. States contemplating the acquisition of nuclear weapons are unlikely to be responsive to arguments that such weapons are not needed, not useful, and too dangerous to possess when the current nuclear powers not only hang on to their weapons but continue to increase their strategic capabilities. Investments in the hundreds of billions or trillions of dollars in new nuclear weaponry assure potential nuclear powers that current nuclear powers are not serious about disarmament. Third, strategic upgrades are inconsistent with the nuclear weapon states’ commitment under Article VI of the Treaty on the Non-Proliferation of Nuclear Weapons. Article VI commits nuclear weapon states to “pursue negotiations in good faith on effective measures relating to cessation of the nuclear arms race at an early date and to nuclear disarmament, and on a treaty on general and complete disarmament under strict and effective international control.” It is difficult to imagine that strategic upgrades can be occurring while efforts are undertaken to pursue effective international control and reduction of nuclear stockpiles. Indeed, strategic upgrades easily develop into an arms race, and thus give non-nuclear states further reason to doubt that they should remain committed to the NPT. It may be right that unilateral disarmament is neither possible nor wise in the contemporary security environment. But the fact that current circumstances do not permit the abolition of nuclear weapons does not mean that strategic upgrades to nuclear arsenals are morally or prudentially justified. The longer nuclear weapon states continue to upgrade their arsenals, the more likely it is that more non-nuclear states will join the club, further eroding the NPT and risking a world of widespread nuclear proliferation and the attendant increased risk of deliberate or accidental nuclear weapons use. This point has been decidedly lost on an administration that aims to exercise moral leadership on global nuclear policy. Scott Wisor is Lecturer in the Centre for the Study of Global Ethics at the University of Birmingham. Obama’s routine is called ‘fancy footwork’. 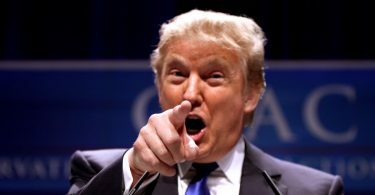 While the neocons continue in control of American foreign affairs, that is, indefinitely, the US imperium will not abandon its nuclear powers and advantages. I agree with the points that you make, but I think there are additional complications. Obama, I assume, would prefer a controlled and balanced global reduction, not a unilateral, age-driven deterioration of the U.S. arsenal while other countries’ arsenals are maintained. That creates pressure for investment to maintain the quality of the arsenal. The presumably different stages of deterioration of the various countries’ arsenals will complicate the job of coordinating such investments (with other countries also suggesting that you’re exaggerating your need for investment), if such coordination is even attempted. At the same time, the services, industry, and Congress will insist on taking advantage of all the latest technical advances that have sprung up since the last upgrade (since you’re spending the money anyway), which will also be viewed suspiciously by other countries. Regarding the overall pace of reduction, absolute reductions on the scale of START I won’t be repeated if only because that many weapons don’t exist anymore. Beyond that, however, it becomes harder to negotiate major mutual reductions the closer the overall arsenals get to zero, because someone on both sides will insist that its side needs to maintain some kind of margin of error. In addition, it will be harder for the U.S. and Russia, specifically, to negotiate major mutual reductions the closer their forces get to China’s levels (and eventually India’s and Pakistan’s) unless those countries agree to join the negotiations as well. This may affect Russia before it affects the United States because Russia will have to take Chinese IRBMs into account, while the U.S. won’t. Russia’s growing doctrinal reliance on nuclear weapons–rooted in the long-term deterioration of its conventional forces–will also make it more reluctant to agree to further cuts. Perhaps the current investment in conventional forces will reduce that concern in the future. We’ll see. Considerations such as these, I think, explain the modest reductions achieved in the New Start treaty (although the treaty’s verification measures still make it worthwhile) and Russia’s subsequent reluctance to negotiate further. An improvement in overall East-West relations would certainly help, but that isn’t the whole story. Thanks Scott for a thoughtful and insightful comment. I agree with much of what you say. These are indeed some of the reasons that explain both a) why the Obama administration has moved forward with modernization and b) why it will be difficult to reduce arsenals in the future. Indeed the US would prefer a balanced global reduction, and would be serving the broader interests of non-proliferation and disarmament if they use cuts in their own arsenal to secure reductions abroad. That said, if the underlying logic is that the US can never forgo a strategic upgrade or a reduction in aggregate numbers without commensurate cuts by other nuclear states, this logic appears inconsistent with a vision of a world free from nuclear weapons. My own view is that considerable reductions could be undertaken today without jeopardizing much if anything of the deterrent value of American nuclear weapons. In any case, my broader point is simply to note that rhetoric which favors a nuclear free world isn’t particularly meaningful if actual nuclear policy is locking in long term commitments to nuclear weapons and arguably incentivizing similar investments elsewhere. But you are right that there are important actual and perceived obstacles influencing American policy.